How many more reports like this have to come out before laws start changing at the state and federal level? How much oil has to spill into the gulf before America makes takes real stab at a constructive and responsible energy future? I can’t believe there is one energy sector disaster after another and nothing is being done. just because somebody writes a report does not make it true .please dont believe every thing you read. Confused – do you have specific criticisms of this report? I’d be interested in hearing your thoughts on this. Of course it’s not true just because it’s written…but both Downstream Strategies & the WV Center for Budget & Policy have strong track records on important research. Also: just because you don’t *want* something to be true doesn’t make it false. Actually confused isn’t that what a report is? I thought that a report was a gathering of evidence in order to support or fight a particular issue. For what it’s worth I knew this long ago, but I had no clue it was this out of control. OK … come on folks, that’s enough of comments that really don’t say much. If you’ve read the blog post — or better yet, read the report itself — please feel free to jump in and discuss in a respectful way. But one-liners about not believing everything you read don’t get us anywhere. Does this take into account the taxes paid by the employees and support businesses that support coal operations? My family and friends make a living supplying parts to a vendor that sells machines to underground coal mines. As for the Reports are simply selective facts that support your side of the story and given by both sides. What would be the effect of the states budget if we didnt have coal mining – why dont they show us that alternative including unemployment benefits, changes in home values and loss tax revenue. I do agree that we should increase the coal severance tax and do something about the road destruction. As for the Permanent Diversification Fund – isn’t that what the coal severance taxes should have been used for over the years but the state leaders have used it for various other issues. Steven, I’m pretty sure the answer to your first question is “yes,” and reading at least the executive summary and parts about their methodology would greatly clarify what was included and not included. What would be the effect on our budget if we didn’t have a coal industry? I don’t think that specific question was what they were looking at, but we wouldn’t have to pay our ineffective regulators, repair roads and bridges nearly as often, and many other costs associated with supporting the industry. I think the report makes it pretty clear that the hardworking tax payers of WV support the coal industry and not the other way around. Did anyone see in the report any accounting of the State tax revenues derived from coal based income taxes ? Any accounting of revenues derived from sales tax generated from coal jobs wages (grocery stores, Walmarts, car dealers, etc) ? Not much of a report. So after looking over the report I notice the Coal severance figure leaves out the 90 million coal companies pay to local government, the workers comp and transportation fund. Not to mention the 90 million from property taxes that go to school boards and local communities. If you were to remove coal these costs would have to be replaced by other sources. The negative impact on the budget by those employed directly or indirectly to me is misleading – wouldn’t these individuals get these benefits regardless of where they work if they work at all? How does an employee at walmart compare to this study since the average salary is considerable less than that of a miner. l hope the Coal Association does do a serious, well-documented, and measured critique of the report, and then the report’s authors can reply in the same vein, and we’ll have a polite dialogue, and really get closer to the truth. But . . . somehow I think I’m dreaming. Meanwhile, I support the report’s call for more severance taxation directed to coal-producing counties. Let’s spend plenty, now, to make coalfield schools a heck of a lot better, top pay for quality teachers, etc. We know these wonderful children deserve and need it. my comment .so if you say its true then i guess it is. Someone educate me here…are they saying that the $174 million in tax credits are a state “cost” of having a coal industry? If so, I don’t buy that, a tax credit is simply a tax not paid, getting rid of the industry doesn’t make that $174 million magically come back to the state as a revenue, the state never had the $174 million to start with. To take a line from 1980’s politics, sound like voodoo economics” to me. What I found most interesting was comparing the net cost of coal to Tennessee and West Virginia – theirs was about $3 million … ours over $90 million. Tennessee is obviously doing more to be proactive to at least try and come out with a balance equation when all is said and done. When is our legislature going to wake up to the fact that – as this study makes abundantly clear – some day the coal is going to be gone, and those of us who still live here are going to be stuck with the clean-up costs for decades and decades to come? And Tom, I’m afraid you’re dreaming – the coal association’s response to this report on WVPR this morning was that it wasn’t a peer-reviewed scientific report and it was from a know group of coal haters who had an obvious agenda. I too was hoping that maybe the pro-coal faction would be willing to enter into a balanced debate. After finding time to at least skim the report I find the above, now it makes a lot a sence, if a coal company buys a new dozer from Walker and doesn’t pay the $100,000 sales tax on it, that is “foregone revenue” to the state, BUT in no way is that a “cost” of having the coal industry. If the coal industry did not exist the $100,000 would not be in the GRF anyway. The way I see it that takes the big headlines from -$97.5 million to a +$76.3, and places this study where it needs to be, lining the bottom of a bird cage. I’m impressed by the thoughtful and thought provoking responses to this article. This discussion needs to be had and decisions made with the welfare of the state in mind instead of political careers. I have always felt that coal was harmful to the state in that it took away the incentive to develop a more diverse economy. WVMountainSoul, the concept of the “resource curse” has been around for decades and is quite well-researched, although usually in the context of third world countries. Dependence on one non-renewable extractive industry keeps out other industry (by design or consequence) which leads to persistent poverty, poor education, poor health and a wrecked environment. Check out Jeffrey Sachs’ writings on the subject, it’s very interesting (and depressing). If you apply this report’s methodology to all heavy industry in WV, I suspect they would all come out with a negative estimated net impact. The only business that might come out positive would be a low employment high revenue business. Some of the posts have already identified some good questions about why certain revenues are not counted or are discounted, e.g., property taxes, or why certain tax preferences are treated as expenditures. Another question would be the attribution as a cost of the indusrty the so called “expenditures” from indirect jobs created by the coal industry. But perhaps that reveals the underlying shortcomings of the methodology in the study. In short, the study is crafted in a manner to cut off measurements of the full economic value of the coal industry including the value of products produced from coal, (e.g., lower cost electricity that allows other industries and businesses to locate in WV, steel, higher wage jobs with health care and pension benefits etc) but maximize the costs attributed to it within the confines of a state budget exercise. It makes no attempt to look at the flow through in the economy or to local jurisdictions. If one deletes both the revenue and expenditures from the indirect employment as well as the attempt to quantify revenue forgone from certain state tax policies, it looks like the coal industry has a net postivie impact of $193,220,000. To be sure, the Ken’s critique that many impact assessments emphasize the revenue and jobs and perhaps overlook some of the costs has some merit, but this assessment does not appear to add any clarity to the question. It seems more like an income tax return understating income and maximizing deductions. If you want everyone to believe that Coal Tattoo is really a blog to discuss the impacts of the coal industry, and not a vehicle for the anti coal community to bash the industry you will revisit this study’s short comings much like you did the Witt and Kent study a few months back. By the way, I agree that the Witt and Kent study was not much more than a PR release by the industry, but this “must read” report (your words not mine) by Downstream is just as bad. I think the fact that we’ve had 20 comments so far, many of them offering strong criticism about this report speaks to the fact that Coal Tattoo is a great place for discussions about the coal industry’s impacts — both positive and negative. If you read the Downstream Strategies report, they actually do a pretty fair job of outlining some of the potential weaknesses themselves, and they say right up front that they are offering estimates and that their report is imperfect. For example, some readers have complained the study isn’t complete because it didn’t consider and account for coal tax contributions to county and local governments — but the authors point out very early on that they’re working on another report that will address those issues. Now, go back and look at the Witt/Kent study (here’s the link — http://www.be.wvu.edu/bber/pdfs/BBER-2010-04.pdf ) and show me one sentence anywhere which acknowledge in any way any negative impacts from the coal industry. Seriously. Show me just one. The Downstream Strategies report could have been better in many regards. For example, I don’t think they are clear that environmental groups FUNDED the report — they refer to them simply as having made “contributions,” and don’t make clear those were financial contributions. A more detailed accounting of who paid how much would have been more transparent. Also, it would have been helpful to have a section where various flaws were all listed — much the way that peer-reviewed journal articles provide a discussion of the problems with their work. But I’ll stand by my characterization of the report as a “must-read”. That doesn’t mean it’s perfect. No report or study — or blog post for that matter — is ever perfect. But like the previous Downstream Strategies report on the declining coal production in Central Appalachia, this document makes an important contribution toward helping West Virginians understand the positive and negative impacts of coal on our state and we try to navigate what the industry’s future could and should be. Thank you for your comment, Ken. And I apologize, we should have been more active in participating in this discussion before now. However, as folks can imagine, the report has generated a good bit of media interest so we have had to respond to calls and emails. I will provide a series of responses to everyone’s comments after the end of the working day today. However, I would like to say that I agree with Ken’s comments. This report was a first attempt at quantifying the costs of coal industry activity on the state budget. While some calculations and results may be imprecise, we worked hard to ensure that they were at least plausible, and we relied heavily on official data sources and information in order to develop methods for generating estimates where official data was unavailable. Also, I agree that we could have made it more clear at the beginning of the report as to who funded it. There was no intention of hiding our funding sources, but we certainly erred in how we discussed funding. And finally, for now, I will make sure that future reports do indeed include a section specifically dedicated to the report’s flaws, rather than discussing them throughout the report where relevant. I appreciate the suggestion. I will provide more pointed responses later on. Thanks again to Ken for the blog, and to everyone who has participated in the discussion. I hope we can continue to address any concerns or issues folks have with our report. Actually, one brief comment. I have to say that, while the sources of funding–in all cases–should arouse suspicion as to the integrity of any research, that information alone should not, and cannot, be used to discredit any report. The integrity of a research paper can only be questioned through an examination of the data, the calculations, and the methodologies used to generate the results. In a similar vein, another criticism that is being used in attempts to discredit our research is that I used to work for Coal River Mountain Watch. I am personally proud of and thankful for the time I spent with CRMW. They are amazing people who are working to protect their homes, families, and mountains, and I have the highest respect for them. I will never apologize for the work I was blessed to do with CRMW. That said, no matter what your opinion of CRMW is, the fact that I worked with them–while also, depending on your perspective, could understandably be used to arouse suspicion of bias–is also not grounds for dismissing our research as biased in itself. Only the research and methods are ultimately open for criticism, and myself, Downstream Strategies, and the West Virginia Center on Budget and Policy, all take pride in the work we do and we strive for that work and the research taht goes into it to be of the highest integrity. Regardless, everyone has a right to criticize the report. I would just ask that you first read it carefully, consider our data sources and methods, and then, if you still disagree with anything or have any questions or concerns, please don’t hesitate to bring them up, and I will address them all. I don’t have the answer. Neither do the people who wrote this study. Neither do the people who will be paid to write the studies that will say this study is a pile of hogwash. But the fact that this question is even being asked in West by-God Virginia, “Is coal really even worth it?” is, to me, a sign that some kind of change is in the offing. That in and of itself is amazing. And it only took about 150 years. Oh, it is so *not* worth it when you consider the land degradation, the destroyed ecosystems, the slurry produced, the water pollution, the coal dust, the miners’ lives and health, the health and psychological effects on those who live nearby, the lost culture, the damage to roads . . . and that’s just from mining. And then there’s the air and water pollution when coal is burned, the global warming gases, the toxic ash . . . But until recently (Hendryx, Palmer, NAS, these guys, etc.) we didn’t have *data* that provided hard evidence that it’s not worth it . . . and now we do. Okay folks, I apologize for the delay. I hope folks are still paying attention to this conversation. I want to first respond to some of the criticisms of our report that have been publicized by members of the coal industry. The first such comment is that our report is flawed in that it does not include the $3+ billion in direct and indirect wages from coal industry activity. Then, if you look at page 49 (PDF page 63), we show that the total wages paid by indirect employment amounted to $1.59 billion. Total wages of direct and indirect coal employment = $3.2 billion. So we recognize and account for the wages, or payroll. However, the purpose of the report was not to account for wages. It was to show the net impact of the coal industry on the state budget, which receives revenues from taxes on wages, not the wages themselves, and we’ve accounted for all of the taxes related to direct coal industry activity, direct coal employment, and the indirect and induced employment. I’ll submit a single post for each response. Second claim: That our report does not account for property taxes collected by counties on coal reserves and capital (bulldozers and other mining equipment, etc). So, as you can see, we intend to account for county-level benefits of coal in a future report, likely to be published by the end of the year or early next year. However, that was not the purpose of the report we just released. This was strictly a report on the impact of coal on the state budget, as the title of the report itself makes clear. In responding to the substance of the claim, however, we recognize that, theoretically, county-level revenues associated with coal could prevent state revenues from being used to support county budgets. That is indeed a benefit for the state budget. However (excuse the numerous “however’s”), it is impossible to separate out which dollars collected by counties would have been replaced with state dollars were those revenues not collected on the county level. In other words, if the coal industry did not pay property taxes to counties, there is no way to know if an equal amount of state revenues would be provided to the counties. However, as we will replicate in the forthcoming report on county-level impacts of coal, I’d like to provide a basic breakdown of county-level property tax revenues attributable to coal. As reported in WVU and Marshall University’s “The West Virginia Coal Economy 2008,” found here: http://www.be.wvu.edu/bber/pdfs/BBER-2010-04.pdf, the coal industry generated a total of $71.4 million in county-level property taxes for the top ten receiving counties in 2008 (total revenues, including state revenues, amounted to approx. $91 million, according to WVU/Marshall. There is no explanation of how the remaining $20 million is distributed, by county). Of that, only five counties (Boone, Logan, Mingo, Kanawha, Raleigh) accounted for nearly 80% of the $71 million in revenues, and over 60% of the total of $91 million in property tax revenues, as estimated and reported by WVU/Marshall. Therefore, it can be concluded that while property tax revenues provide a significant benefit to some local governments, most counties are not dependent on coal-related property taxes for their economic survival. To summarize one last conclusion from the data reported by WVU and Marshall, coal-related property taxes account for more than 10% of county-level budgets in only six coal-producing counties: Boone, Logan, Mingo, Marshall, Raleigh, and Fayette. As a useful supplement to that, coal production from only five southern West Virginia counties accounts for over 50% of all coal produced in the state. The counties are the same as the five counties listed two paragraphs above: Boone, Logan, Mingo, Kanawha, Raleigh. The importance of recognizing this is that claims that numerous counties in West Virginia rely on coal for their economic survival is false. At most, and by arbitrarily choosing 10% as a cut off point, it might be said that a total of six West Virginia counties are to some degree “dependent on coal,” while only three of those counties are “highly dependent” on coal, for their economic survival, while the rest might be designated as only “benefiting” from coal. At most, Boone, Logan, and Mingo counties – which, according to the WVU/Marshall report, rely on property tax revenues for providing an average of 47% of their annual revenues – are indeed so dependent. The next three most dependent counties are Marshall, Raleigh, and Fayette, which rely on coal property taxes for an average of 15% of annual revenues. Finally, while it is true that, to some degree, county-level property tax revenues may preclude the use of state revenues for supporting county budgets, it is impossible to estimate a value for that. However, I recognize that we should have provided a discussion of this in our report. The exclusion of this issue was not intentional. Our timeline for producing this report, combined with our singular focus on the state budget, resulted in the exclusion. In the future, should an addendum to our report be necessary and appropriate, I guarantee that we will address this issue. Please excuse the length of the previous response. A final claim from the industry that I would like to respond to is that coal trucks are having an increasingly smaller impact on the state’s roads and bridges, and therefore an increasingly smaller impact on the state budget. In fact, one response by a member of the Coal Association claimed that the industry paves it’s own way. However, official data and statements published by the West Virginia Division of Highways and the Public Service Commission contradict those claims. In one of the last sections of our report, we provide an estimate, strongly based on official state data, for legacy costs related to damages from coal trucks on state roads and bridges resulting from past coal industry activity. In other terms, these are the costs that have accumulated over time. Our legacy cost estimate for accumulated damage to roads and bridges found in Section 7.2 on page 54 (PDF page 67) was generated using official data and estimates from the West Virginia Division of Highways. 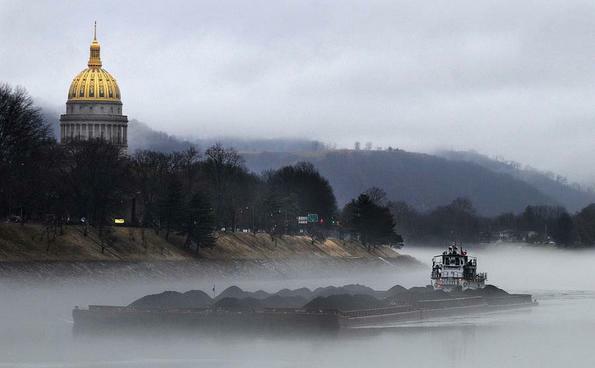 The WVDOH itself reported in 2009 that the revenues from the coal industry were insufficient for making up for the damages caused by coal haul trucks. Additionally, as shown on page 24 (PDF page 38), the number of Class D (120,000 pound weight limit) coal haul trucks operating on the Coal Resource Transportation System has been increasing, not decreasing as claimed by the industry, since the system was put in place by the legislature in 2005. Not only that, the size of the CRTS has been expanding since the system was put in place. Therefore, not only are a greater number of the higher class (weight) coal trucks being permitted, the total number of permitted trucks on the system has been increasing, and the size of the system in terms of mileage has been expanding. Please take a look at the chart on the noted page (24). The numbers were provided directly by the WV Public Service Commission and can be reproduced if you make such a request to the PSC. Now, to respond to comments provided by folks on this blog post. To Steven, who asked if the report takes into account the taxes paid by the employees and coal industry support businesses, we did take the employment-related revenues into account in our sections on the revenues from direct and indirect coal-related employment. You can find those estimates and the methodology for calculating them in the noted sections. We did not, however, take into account the revenues generated by the support businesses, though this was discussed during the process. The reason we chose not to do so is because you have to cut off the analysis at some point. Had we estimated the revenues for industries indirectly supported by coal, we would also have had to account for state expenditures for those industries, which are far more vague and complicated to estimate than state expenditures for the coal industry itself. So, we chose to cut off the analysis at the indirect employment, because beyond that you get into danger of the analysis spiraling out of control. As to the second question in your post, the coal severance tax revenues received by counties are used for various purposes. However, except in select counties, the amount of the revenues is likely insufficient for having any significant impact on funding for economic development, and is largely used to pay salaries of existing county employees rather than for investing in new economic development. Therefore, coal severance taxes received by Raleigh County in 2008 were sufficient for covering the annual salaries of only about 2% of direct government employment. I use that comparison to provide a basic idea of how little the coal severance tax contributes to economic development each year. Property tax revenues obviously add to that, but your question pertained to whether or not the coal severance taxes played the role of our proposed Permanent Economic Diversification Fund for local governments. To Jim, who inquired whether we included state tax revenues from coal-based income taxes, we did. You can find those in the sections on Direct Industry Revenues and the two sections on employment-related revenues. Our aim was to account for all coal-associated revenues that benefited the state budget in Fiscal Year 2009, and I believe we pretty much succeeded in doing so. I addressed the local revenues issue in a previous post. Let me know if you have further thoughts about that. We do include in our report the revenues the industry pays into the Coal Resource Transportation Road Fund. You can find that in Section 2.5. According to data provided by state agencies, the total transportation-related revenues paid directly by the industry amounted to only $2.8 million in Fiscal Year 2008. By comparison, we estimated that the cost to the state for repairing roads and bridges on all coal haulroads, but mostly for repairs on the Coal Resource Transportation System — for which revenues from the industry are dedicated–amounted to $93 million in the same fiscal year. You can take a look at our methodology we used to calculate that cost in Section 3.1. Additionally, that $2.8 million in revenues accounted for less than 0.4% of total state-generated road fund revenues. As another comparison, the $2.8 million accounted for only 3% of the total estimated cost of $93 million. As for the workers’ compensation coal tax–which is a tax of 56 cents per ton of coal mined, and generated, as we present in section 7.3, $77 million for fiscal year 2009–we did not include that as a revenue benefiting the state budget. 2) as related to the first reason, the workers’ comp coal tax is a tax imposed–as related to coal–for paying off a debt resulting from claims related to injuries, illnesses, and deaths resulting from coal industry activity. That is a debt that should have been paid by the industry itself; therefore, the revenues from the tax are being used–instead of for uses beneficial to the state–to cover a cost resulting from past coal industry activity. Also to Steven, in relation to your question about the impact of the budget by those employed by the industry, I already have a response written for this from a previous email I’d received, but it is an exhaustive response, so I won’t post it here unless specifically requested. To Concerned Miner, in relation to your question about the tax expenditures and bird cages, first, i wouldn’t recommend office paper–on which this report is likely to be printed–as liner for the bottom of a bird cage. It is not absorbent enough, and I’d recommend newspaper instead. To your question, both tax theory and state governments all recognize that tax expenditures in the form of credits, exemptions, and preferential tax rates, represent a form of cost to the state budget. “The Tax Expenditure Report recognizes that programs funded through tax expenditures are, in effect, receiving priority funding over other programs (WVTD, 2009a). In other words, there are many reasons why tax exemptions, credits, and preferential tax rates are provided. These may include supporting small business, attracting new industry, incentivizing job creation generally, or supporting the public through suppressing costs for vital public services. In other words, the reported expenditure estimates do not take into account the positive economic and revenue benefits of providing tax exemptions and credits. See pages 14 and 15. This document provides a good overview of why such expenditures are provided, and how the provision of such expenditures should be approached and analyzed for their impact. I’ve addressed the flow-through portion of your question in a previous post. I would say, in response to your comment about cheap electricity, that as well all know, as the cost of West Virginia coal has been rising fairly rapidly since 2000, the state’s utilities have, particularly over the last few years, been attempting to recoup those additional costs through stepwise increases in electricity rates. If I remember correctly, AEP’s request in 2009 was for an increase in average rates from about 7.2 cents per kilowatt-hour in 2009 to over 12 cents per kWh by 2012, for an increase of nearly 70% in only three years. This will likely have an impact on the attractiveness of the state for businesses to locate here, not to mention commercial and industrial costs for activity that already exists in the state. The implication here is that relying on coal for electricity is becoming increasingly detrimental for the state’s economy due to the volatility of coal prices and the likelihood that such prices will remain at a high level from now on (even during the recession, the lowest price for Central Appalachian coal was just under $50 per ton. It’s now back up above $60 per ton). Also, you are correct that if we were to delete the employment portions of the analysis, then the coal industry provides a net benefit. We also clearly state that in the report, and even caution against focusing on the net impact calculation. It was actually our intention to steer the focus away from the net impact calculation, and direct it more toward the substantive portions of the report, such as the legacy costs section, as one example. Regardless, expenditures on employment are important to consider, whether or not they should or should not be included in a calculation of net impact. Further, as I noted in my previous response, I do have a response to the employment question prepared, and will post if it is requested, but I feel I’ve overdone the responses for now. There are some important implications stemming from the employment analysis, however, and I’ll be happy to post my response–which is a lengthy one–if you all would like me to. Question – are the state’s coal haul roads, mentioned as a major expenditure, also used by area residents? Besides the private roads used and maintained by the companies, how much of the public roads overlap with residential, agricultural or other usage? If so, can you accurately quantify the net damage caused by coal trucks in tax dollars per mile per year? I would do some digging to be sure these are not expenses that have been overstated and would already be paid for regular road maintenance.